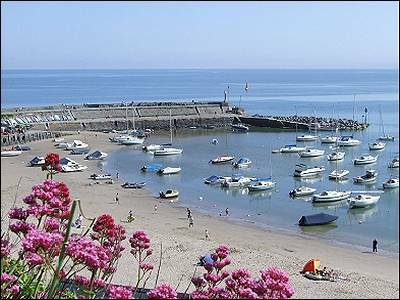 Brynonnen is a large and very spacious four bedroom traditional Cardiganshire farmhouse situated in a leafy lane in the hamlet of Nanternis, close to the popular coastal resort of New Quay, famous with its bottle nose dolphins and water sports. The property is situated very close to the Ceredigion Heritage coastline and has distant sea views. If you enjoy walking then Brynonnen is an ideal base as you are able to access the coastal path from the farmhouse and it even has its own beach - reached only by a footpath or from the Coastal Path! Two well behaved dogs welcomed. As Brynonnen is a working farm guests are welcome to arrange a tour of the farm with the owners. Accommodation - The farmhouse is approached off a minor road through a stone pillared entrance onto a hard base track that sweeps around the traditional farmyard. The house is situated on a working farm, so there is an opportunity to see some sheep and cows through the bedroom windows. The four bed roomed farmhouse has an oil Rayburn in the kitchen and an oil fired stove in the lounge, and the house is also heated with economy 7 electric heaters with the electricity generated by our own wind turbine which is located on one of the farm fields . There are two entrances to the house, the first entrance leads into a porch with integral garage which houses a full size table tennis table, and also storage space. There is also a large utility room adjacent to the porch in which there is an upright freezer, washing machine and a sink. A door leads from the utility room to a garden at the rear of the house. Kitchen - Brynonnen has a charming farmhouse kitchen, with fitted units and an integrated dishwasher and fridge. The kitchen is fitted with an old inglenook fireplace with a stone wall which now accommodates an oil fired Rayburn. An oak table stands in the kitchen and it can be extended to accommodate 8 people. The kitchen is fully equipped with all the utensils and crockery and cookware that you will need, and there is an electric hob cooker, as well as the Rayburn, microwave, kettle and toaster. Lounge -The lounge of ample proportions has leather settees to accommodate up to 8 visitors, and the entertainment includes Satellite TV with integrated DVD player, a radio and CD player, plus a pool table. There is also an oil fired woodstove set in a stone fireplace. Downstairs WC - We have a WC and shower room downstairs. Bedrooms - The property has 4 large bedrooms. 1 bedroom with a king size bed, two bedrooms with double beds and one bedroom with twin beds. All beds will be made up ready for your arrival. All the bedrooms have good storage, CD/Radio players and all the linen and towels are provided in the hire charge. Upstairs bathroom - The upstairs bathroom has a WC, hand basin and bath. We can of course provide a cot and mattress and a high chair should you require them. Should you wish to take advantage of our coastline and enjoy boating, then we have ample storage for a boat, and plenty of room for water sports equipment. Dogs - We welcome up to 2 dogs (£20 per dog) - allowed on the ground floor only, Dogs should never be left on their own in the cottage. Please be aware that the farmhouse is surrounded by sheep pasture. Security / cleaning / breakages deposit - This property has a £150 good housekeeping refundable bond, which is payable to the owner on booking. Short breaks - Short breaks may be available by arrangement - minimum £350. Outside - There is garden furniture and a gas barbecue set available for your use and a large parking space in the yard. The garden at the rear of the house has a side entrance door which can be closed should you wish the garden to be secure for children. Approximately 3 miles to the south is the cove of Cwmtydu where folklore states that a local character called Twm Sion Cwilt used to smuggle booty in to the area. there are old lime kilns to be seen, and sometimes porpoises and seals are seen in the waves in the cove . 11 miles to the north stands the picturesque Georgian town of Aberaeron, which apart from its renowned honey ice cream hosts many mouth watering establishments one of which is The Harbourmaster Hotel which has had numerous positive reviews in the national press. We look forward to welcoming you to Brynonnen , where there will be a small selection of Welsh produce for your enjoyment on your arrival. Coastal Path: This house is just a few hundred yards away from the new Ceredigion Coastal Footpath which will take you to Cwm Tydu and Llangrannog to the south or north to New Quay, Aberaeron and eventually to Aberystwyth.